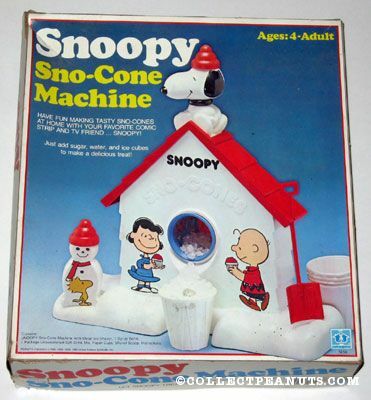 The Snoopy Sno-Cone Machine by Hasbro. This was our first Fourth of July living in Florida. We enjoyed a BBQ with my aunt, uncle and cousins. When the sun went down, we headed to the beach to watch the fireworks at the beach and indulged in a tasty sweet snow cone. Munching the soft ice reminded me The Snoopy Sno-Cone Machine, a toy I had always wanted, yet never owned. The Snoopy Sno-Cone Machine seemed like the type of toy that was cool for like a week or two, but then became tiresome. I could definitely see the novelty wearing off for me so I'm glad my folks never bought us one. The Snoopy Snow-Con Machine was first introduced in 1979. Although it is no longer a Hasbro toy, The Snoopy Snow-Con Machine is still available from your favorite toy store for less than $20. Here's an old-school commercial for the Snoopy Sno Cone Machine snow cone maker. My husband and I were just talking about there the other day. I'm pretty sure my machine is still at my mom's house. I loved that thing! I remember those. My kid brother had one. I actually memorized that jingle. That's how pathetic I am. I loved that damn thing. My sister and I couldn't wait for the warm weather to come to get that out of the basement and start making sno cones. It was a fun concept because it was cheap and easy. Ha! I still have mine, along with my Speak and Spell. I had it and I LOVED IT! I had the Snoopy machine. It did become a bore after a while, and I don't remember making snow cones with all the time. I was thinking about buying my kids one because of all the "fun" I had with mine....but wait I didn't. Better off keeping the $20 I guess. i HATED this toy! endless cranking with no results! i never did get a damn sno cone outta that thing. boooo! I have one in my cabinet! Wonder if my grandkids might enjoy trying it out? I had forgotten all about it. My youngest daughter wanted one for Xmas so we got it. You are right, she did get tired of it fast. Had it! It was awesome! Lasted about 6 weeks. Awesome while it lasted though. Remember the ad too, yes. I had a crush on the blond girl who says Yummy Snoopy. I begged my parents for one of these. BEGGED. They said no. I found one at a garage sale that was missing parts. It didn't work. It was rusty.